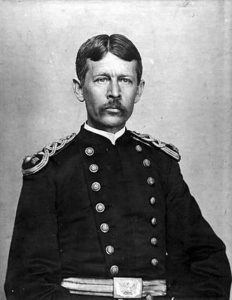 Walter Reed, the U.S. Army doctor for whom the world-renowned Walter Reed Army Medical Center is named, was born on September 13, 1851. His legacy derives from his experimental work that unmasked the true source of yellow fever epidemics, thereby saving the lives of countless millions in tropical and sub-tropical regions of the world. From a conservation perspective, however, Reed is truly important as a pioneer in the field of public health, the ecology of humans in the environment. Walter Reed was born in Virginia, attended schools there and earned a medical degree from the University of Virginia—the youngest graduate, at age 17, ever in the history of the school. He performed additional training and residencies in New York before enlisting as an army surgeon. He had a young wife and family, and he decided the army would provide the financial stability he needed—and the opportunity to see the world. He was right. For the next 18 years, he and his family were stationed all over the U.S., with stints in Arizona, Nebraska, Alabama and Minnesota. The western tours made him tough and practical, but did not dull his intellect or curiosity. When he returned east in 1890 to become inspector of recruits in Baltimore, he took opportunities to study the emerging fields of medical bacteriology and physiology, eventually becoming a medical school professor on the side. For about a decade in the 1890s and early 1900s, Reed gladly accepted assignments to investigate epidemics of typhoid fever and then yellow fever. Both diseases were devastating to military troops, and the methods of transmission were grossly misunderstood. Reed established experimental protocols to test folk-tale explanations of spread, alongside ideas from the emerging field of epidemiology. The work was especially important for yellow fever. Throughout history, the disease had devastated the southern U.S. and the Caribbean region. In the Spanish-American war fought in Cuba, many more soldiers died from yellow fever than from combat. Reed and his team showed that the Aedes mosquito was the culprit. They were the first to use human subjects in their experiments—and, perhaps as important as the work itself—were the first to gain informed consent from patients before being used in experiments. When it was clear that mosquitos caused the problems in Cuba, a massive program to eliminate breeding sites—standing water—began. Unneeded standing water areas were drained and necessary ones were screened. The results were world-changing. As Reed’s biography states, “Yellow fever, which had ravaged Havana for 150 years, was essentially eradicated in 150 days.” The same knowledge allowed the U.S. to complete the Panama Canal, which the French could not do because of devastating losses of workers to yellow fever. Reed demonstrated, over and over with different diseases, that human behavior, the human-modified environment and nature all interacted in both simple and complex ways to produce or avoid human health issues. And as Gro Harlem Brundtland would state so lucidly nearly a century later, the issues of public health, poverty and environmental sustainability are not three issues, but just one. Walter Reed died at age 51, in 1902, a victim of a burst appendix.